Sarah counsels special taxing districts on matters relating to contracts, public procurement, open meetings, construction and finance. 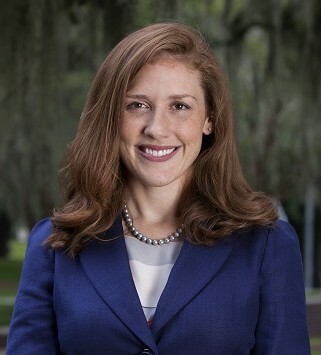 Additionally, Sarah counsels indenture trustees, bondholders and community development districts on matters involving land secured, tax-exempt debt. A Tallahassee native, Sarah grew up a Seminole fan and enjoys spending time at St. Teresa Beach with her husband, Ryan, and their dog. Counsels community development districts on a matters relating to contracts, public procurement, open meetings, construction and finance. Counsels indenture trustees, bondholders and community development districts on matters involving land secured, tax-exempt debt. Former intern to the Honorable Thomas G. Wilson of the United States District Court for the Middle District of Florida. Served as District Executive Secretary in the office of Florida State Representative Evan Jenne, District 100.